I know it’s been a long time since I’ve written. I know you must think I am not a loyal friend. I know I have not kept in touch. I know my last letter was wasn’t very pleasant. I know all these things. But I also know if I tell you my reason you will understand and forgive me. At first when we connected on Facebook I thought by reading all the posts of condolences I have been receiving you would figure out what’s been going on in my life. Then I remembered you don’t read Farsi … so now I have to tell you myself. My mother died two months ago. I write these words “my mother died” and somehow if feels like there is nothing left to write. As if since she has died, nothing that happens will ever matter. And so all I can think of to share with you is to tell you what happened exactly. In the last letter I wrote you I told you my cousin Marjan had died. During those last days, when we were all at the hospital with Marjan, my mom would see me checking my Facebook account constantly and ask if I had any news of you. She wanted to know if you were able to send the cancer medication Marjan needed. And of course ask about your sister’s health. My mom would ask my aunt who is devout and prays five times a day to include your sister in her prayers. And of course my aunt would do just that. She would pray for her own daughter and your sister to beat cancer, for your brother so he would return home from his military service safely, for me and of course always for you. All these prayers, and to what end? Even God can’t cure cancer without the needed medications. My aunt’s prayers for your sister came true. But that is because your sister had access to the needed medication. It’s not your fault I know. I understand and respect that you didn’t want to break the law by sending sanctioned medicine to Iran. But you don’t know what these sanctions are doing to us. I sometimes wonder if you read any of the news reports that pass across your desk. And your thug uncle … using his power in Senate to impose sanctions that end up leaving us without things like medicine. And so Marjan dies and is no longer with us. After Marjan died my mother was never the same. Still she managed to celebrate with us when Rohani go elected. One of the first things she said when his victory was confirmed was “Now John’s mom can visit Iran and I can cook her Ghormeh Sabzi and Fesenjoon. I hope she will like the food here.” All I could manage to reply was that I am sure your mom will like the food and that she had eaten Iranian food before at your neighbor’s house. My mom got upset thinking of your mom hanging out with Monarchists!! You know my mom was never a fan of the Shah and isn’t too keen on those who still want Iran to go back to being a monarchy. I think I asked you over and over to explain this to your mom and dad. By the way, did you ever explain the difference between Iran and Iraq to your mom and dad? After all, these two countries were at war with each other for 8 years. These days I am sad. But I try to hold onto my hopes until that day when the differences between our countries can be resolved. And then we can visit each other. 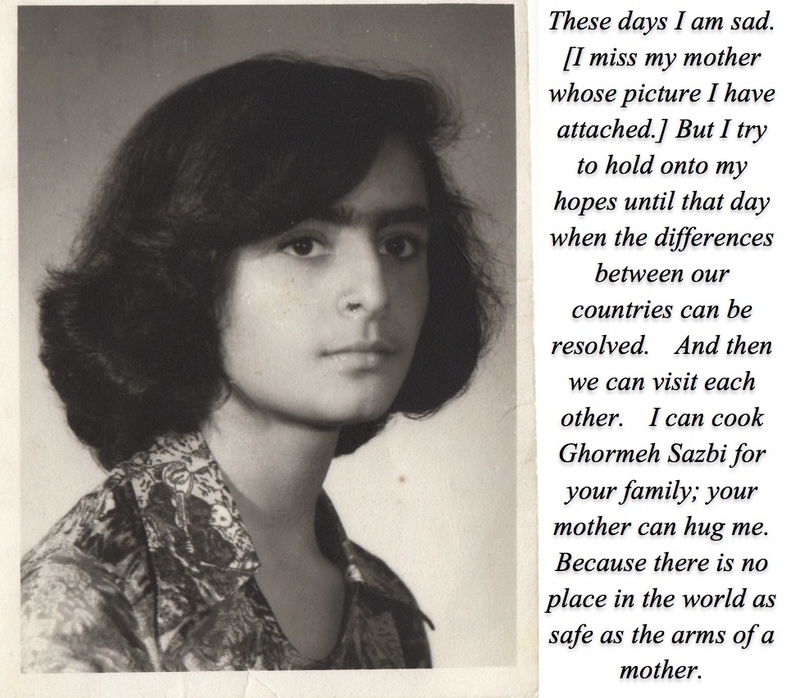 I can cook Ghormeh Sazbi for your family; your mother can hug me. Maybe then I will find some peace and comfort. Because there is no place in the world as safe as the arms of a mother.